Leon Marais Travel Writing and Photography. We were on standby for the two Matimba male Lions who were associating with a single Lioness from the Othawa pride. As Lions were in relatively short supply the line up was quite long, and between being on third standby (only three stations are allowed in the sighting and a maximum of three on standby) and being called in the sun had set and we’d missed our drinks stop. And the Lions had moved off… But sometimes things turn in your favour. They were last seen heading westwards along the northern bank of the Sand River, and we set headed to Second Crossing where they were due to emerge. On arrival at the crossing we found the Lioness resting up on a large granite boulder in the riverbed. Under spotlight the scene was fantastic, and fortunately I had changed to spotlight photography settings before it got dark so was ready to hit the shutter as soon as we came to a standstill. She wasn’t up there long however and soon came down and headed towards a crossing point on the river. Soon enough the male appeared, trailing behind the female. She crossed by jumping over some rocks in an appropriately elegant fashion, hardly wetting her paws in the process. The males however were a lot older, and one in particular was not in very good shape, so hopping elegantly across was not going to happen. The stronger male tested the water in numerous places, hissing and snarling in obvious frustration – boy did he want to follow that female, but why did she make it so difficult? Eventually he decided to cross, wading almost chin deep before emerging on the southern bank. The second male was even more awkward, taking a long time to gain enough courage to cross, face fused in a snarl as he went. We had a good position, our guide Promise from Idube parking us on the southern bank, where we could look back and see them crossing front-on, rather than from the back as the other two vehicles experienced it. All in all a great sighting, with some good results using the standard spotlight photography settings: Manual Mode; High ISO (1600 – 3000, depending on your camera; a wide open shutter; and a speed of between 1/60 and 1/80, depending on the light and conditions (if the whites are too bright you can increase the speed; if the image is a bit dark you can drop the speed, you need to keep it dynamic as the lighting conditions change – the spotlight is constantly moving so no two shots offer the exact same lighting conditions). I was using my back-up camera (Canon EOS 5D Mk1) as my Mk2 is in the repair shop, and the Canon 100-400mm L IS 2 lens. Not the ideal wildlife rig but the image quality is still great! Hope you enjoy the read. Kruger is a massive park, some 20 000+ square kilometers in size, roughly. That’s the size of Wales or Israel, just for comparison. The south of the park, from about Satara Rest Camp southwards, is generally the best region in terms of game viewing, especially in terms of the big cats. Cats can be scarce in the north; going several days without seeing any is not unusual by any means. The habitat is also somewhat less diverse, vast swathes of the region north of the Olifants River are dominated by Mopane (Colophospermum mopane), a broad-leaf tree that can become quite large but in many areas the soil quality is such that they remain ‘stunted’, Elephants of course also denying them in the vertical realm. But this doesn’t mean ‘the north’ is not appealing. Quite the opposite in fact, the north appeals because there are fewer camps and no major tourist towns outside the park gates, apart from Phalaborwa near Letaba Rest Camp – this means fewer tourists than one finds in the south, giving it a more ‘remote’ feeling. The stunted Mopane veld also makes for unobstructed views, and horizon to horizon views create a sense of ‘epicness’, that one doesn’t often get in the south. And another plus for the north is the Elephants. While you do of course get Elephants in the south, and plenty of them, the north is renowned for big tuskers – home ranges of many past and current big tuskers are centered around the Letaba / Mopani region. On a recent visit we had some great views of these behemoths of the north at a couple of water points in the vast Mopane belt of the central / northern region of the park – with very few other tourists around to share it with us. So, while the south is a must, especially for the first time visitor, the north is not without its appeal by any means. Birding is equally good northwards up to the Punda Maria / Pafuri area, where it gets even better. The bottom line is that any part of Kruger is great, each has its own appeal (and that’s why we include three or more camps, to show off the diversity of this incredible national park) and any day in Kruger is a great day! Action around the water reservoir. A bit of sparring on the side. Floppy ear investigating his shadow. Big tusker approaching water with caution. Australian Zoo Safari 2016; Part 1. In May 2016 we (Lawson’s Birding, Wildlife & Custom Safaris) once again hosted Kevin Folland and his South Australian Zoo Volunteers’ group, this time 18 participants in the herd and this was Kevin’s fifth safari with Lawson’s since 2013. Once again it was a roaring success, with the Kruger and Sabi Sands producing some of our best game sightings yet. We started our Kruger section with two nights at Skukuza, followed by two nights at Satara and finally another two nights at Lower Sabie. From there we moved over to Idube Game Lodge in the Sabi Sand Game Reserve, which was mind-blowing as usual (well, perhaps even more so, as even this fine reserve has it’s peaks and troughs). But let’s let the photos speak for themselves… Part 1: Kruger National Park, 8 – 13 May 2016. Glaucidium capense – African Barred Owlet. And shortly afterwards this African Wood Owl spotted by Leon. Not forgetting the birds: Verreaux’s Eagle Owl spotted by John. To give you an idea of what the non-zoom view was like – quite a spot! The curious case of the re-appearing Python. In April 2015, with the same group, we spotted this African Rock Python in ambush position up in a dead tree. It then dissapeared from that perch for the rest of the winter and summer, and we were astounded to find it back there this year. A quartet of Plains Zebra on a misty morning south of Lower Sabie. 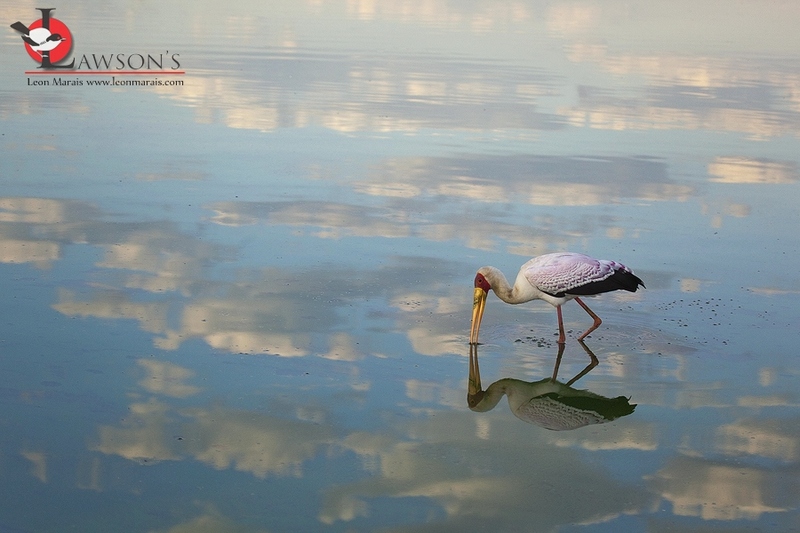 Walking Among Clouds, Yellow-billed Stork at Sunset Dam. Baboons allogrooming as they end off their day. Elephant taking offence at an Impala sharing the waterhole. The other local Glaucidium species – Glaucidium perlatum, the Pearl-spotted Owlet. A bit of rest time after the action before they heard an rutting Impala off in the distance and headed off to investigate. Is it ‘follow my leader’? A game of chase ensued..
Our third major highlight: we found a female Cheetah and her four youngsters on our first morning out of Satara, spending 45 minutes with them. Lioness and her scratching post. This big male was trailing behind the rest of the pride, one of the dominant males of the area. Second major highlight – a big pride of Lions found in the late afternoon on our way to Satara. The first major highlight – a pack of Wild Dogs, 17 by some accounts, on the move from Delaport’s Waterhole. Dogs on the move in low light are almost impossible to photograph well, here’s where video is a much better option. Magpie Shrike in elegant pose. A herd of Elephants surge across the road in front of us on our first morning drive from Skukuza. The curious case of the reappearing python. On our April 2015 South Australian Zoo Volunteers’ Safari we were ending off our Kruger stay at Lower Sabie Rest Camp, a very popular camp in one of the best game viewing regions of the park. After settling in we decided to take a drive along the Sabie River, hoping for that Leopard that was still eluding us. But we were on the lookout for anything of interest (well, us guides were at least! ), and a few kilometers up the road something caught my eye, a reflection of light from a dead branch. Yet dead branches should offer almost zero reflection, and I immediately realised that I was looking at a smallish African Rock Python lying in ambush position on the end of a dead branch, waiting for doves to alight before drinking in the river. It was a phenomenal spot, one of my best ever, and soon the people in gathering cars were marveling, aghast at how I could have seen it. Anyway, we moved on, and on my following visit in June, and all subsequent visits, I scanned the branch as I passed by, but the snake had moved on. In May this year I was again at Lower Sabie, with the same group of people in fact, and once again we headed up the river late one afternoon to end off the day. I was leading and decided to make the ‘snake tree’ my turn-around point to get back to camp in time for the 17h30 gate closing time. As I approached the tree (basically a dead tree with one single branch) I saw that it’s shape had changed slightly, and sure enough, just over one year since the last time, the snake (we assume it’s the same snake, it’s at least the same size) was back on the branch, leaving us a little nonplussed, to say the least. Jason Stewart, who was guiding with me on both occasions, is our resident herp expert, with plenty of experience with Pythons, and is also at a loss to explain it. Maybe just a coincidence? Well, that’s the thing I guess, you never know what to expect on a safari… Here’s some insight from Jason: “Pythons don’t really have a territory in the true sense of the word but they will stay in an area like a home range if conditions are suitable. It is probably a spot he/she uses fairly often during certain times of the year. During the hotter months it’s unlikely to use it, being exposed to the heat during the day as we saw it but you never know what happens later on. Such ambush tactics – where they go up onto an exposed branch and wait for birds to land and catch them – have been documented before and likely the birds wouldn’t see him when coming in to perch. If it stays in the area longer and increases in size it will stop using it as the prey will be too small, there will be better pickings on the ground like francolins etc”. Here are two other examples of small African Rock Pythons in ambush position on branches. In all three cases they were close to water, which makes sense, as the chances of a bird landing on a particular branch increase significantly when there’s water in the immediate vicinity – birds like to perch first to scope the area before going down to drink. And in the last photo, taken in Botswana’s Tuli Game Reserve with a small ‘point-and-shoot’ back in 2007, we see the results of the ambush as a Python grabs a Cape Turtle Dove that landed on the wrong ‘branch’. Photo of the Day: Walking Among Clouds.